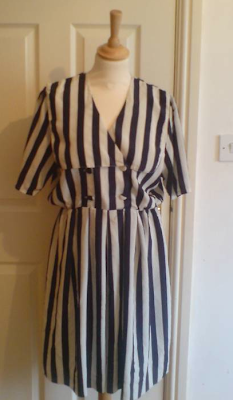 Just wanted to show you this gorgeous little Vintage dress I just won on eBay for £5.50. I love it! I’m thinking of taking it up by a couple of inches when it arrives for a more flattering length. Its a size 14, but on a size 10 mannequin, so as you can see its quite baggy, but styled up with a nice waist belt and some tights and little boots it should look great. I also thought it would be nice for summer, teamed with a little cardi in a contrasting colour, and some sandals. Can’t wait for it to arrive! LAST REMINDER! GIVEAWAY CLOSES AT MIDNIGHT TONIGHT! ENTER HERE NOW! I LOVE that – such a bargain! Why wasn't I on eBay this morning I ask myself…?!? oh wow, stunning find. I really love it!